Wash and soak idli rice and urad dal with fenugreek seeds in water each separately for 5-6 hours. Grind the soaked idli rice and cooked rice adding enough water and transfer to a bowl. Then grind the soaked urad dal to a smooth paste and mix with the rice batter. Mix well. The batter should be thick. Keep the batter for fermentation in a warm place for about 8-10 hours ( or overnight). Perfect and healthy breakfast. Oh I love your serving bowls. they look so cute. Very nice! A healthy breakfast in most south-indian homes. Thanks for your visit. Liked your space. Happy to follow you too. OMG I am dying to eat idlis ..did not bring my idli vessel.. they are too tempting. 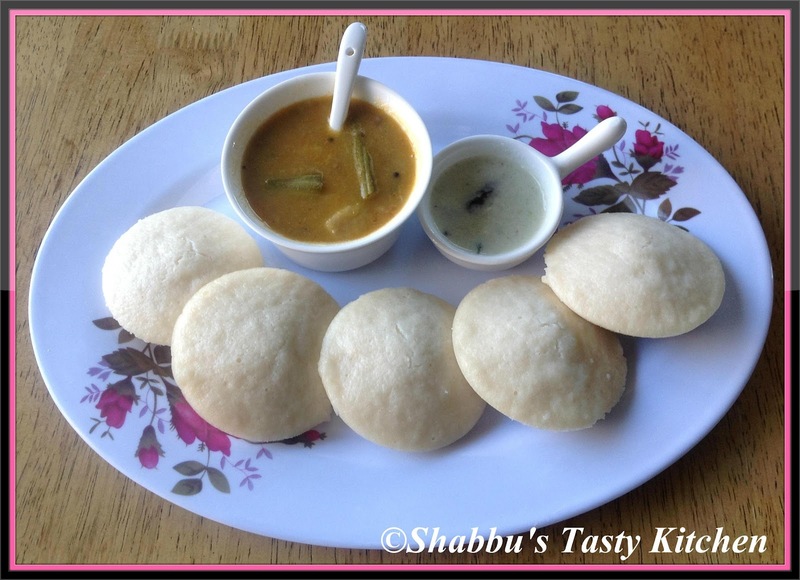 Hot steaming idlis with sambhar and coconut chutney is my all time fav....ur plate is so tempting! Soft & delicious breakfast,love idlis!! Soft idlis, sambar and chutney.....wow a perfect breakfast dish infront of me now....lovely. delicious idlis dear ! !looks great !! !I too prepare batter for idli and dosas the same way !!! !using a little fenugreek seeds really helps to bring out the flavor!!! !